Our restaurant was established in 1988 with one main goal in mind, to bring you the most authentic cooking from the Mexican heartland. We change our menu daily in order to bring you more than 180 different culinary delights from different regions of Mexico, all made with the freshest ingredients. Our different dishes are unique and unrivaled anywhere else in San Diego, and our warm atmosphere and friendly staff will make you feel like you are eating with family. We offer free samples of our daily dishes to help you make the best selection. 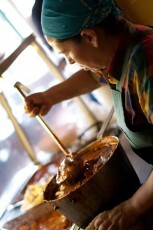 Familiar and traditional favorites like birria de chivo, mole poblano, pipian, and menudo offer a real taste of home.